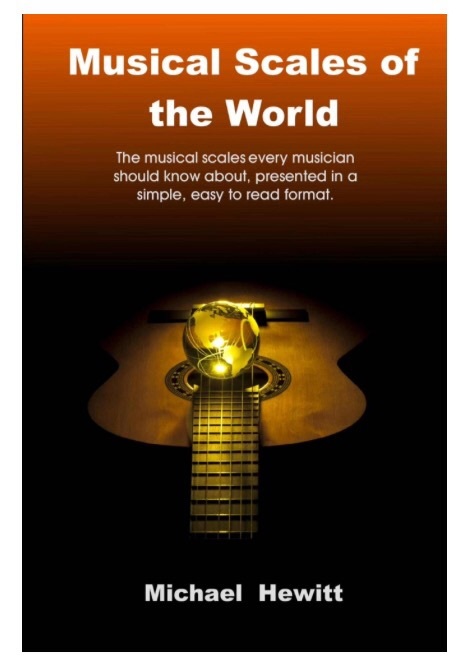 So my adventures in harmonics continues with a foray into Dr. Michael Hewitt’s book, Musical Scales of the World. (This book is a wonderful resource. Carnatic Water Music is based on an Indian Carnatic scale from the book.) Hewitt includes scales from India, Thailand, Africa, Greece, and Eastern Europe in the eight chapters of the book. My favorite chapter is entitled Synthetic Scales and Modes, which is made up of invented and found scales. In this chapter Hewitt discusses the Acoustic Scale, so named because it is based on the harmonic overtones that are present in the atmosphere of any room. (See post on Nature’s Chord at http://wp.me/p5yJTY-iH) WoW! Just WoW. The acoustic scale is also sometimes called the Lydian dominant scale, due to the prominent dominant seventh chord on the first degree (C E G Bb). The presence of this chord can give Lydian dominant music a powerful sense of unresolved dominant tension. When persistently denied resolution, this tension can be harnessed to create a powerfully expressive force. The scale is also referred to as Bartok’s scale as it was the basis for many of his compositions. 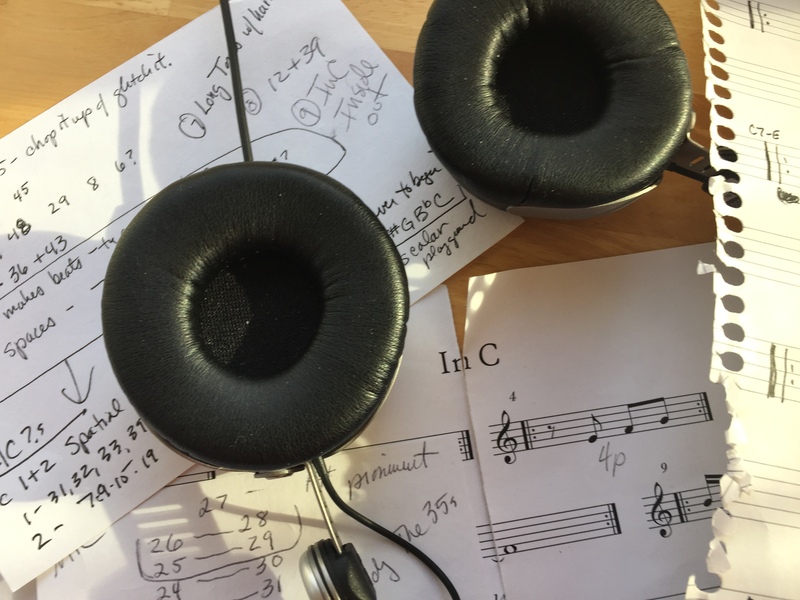 The scale came into favor with contemporary classical music composers of the late 19th, early 20th Century as they moved away from the major/minor pallette of the Common Practice era. I am excited to see this scale identified. 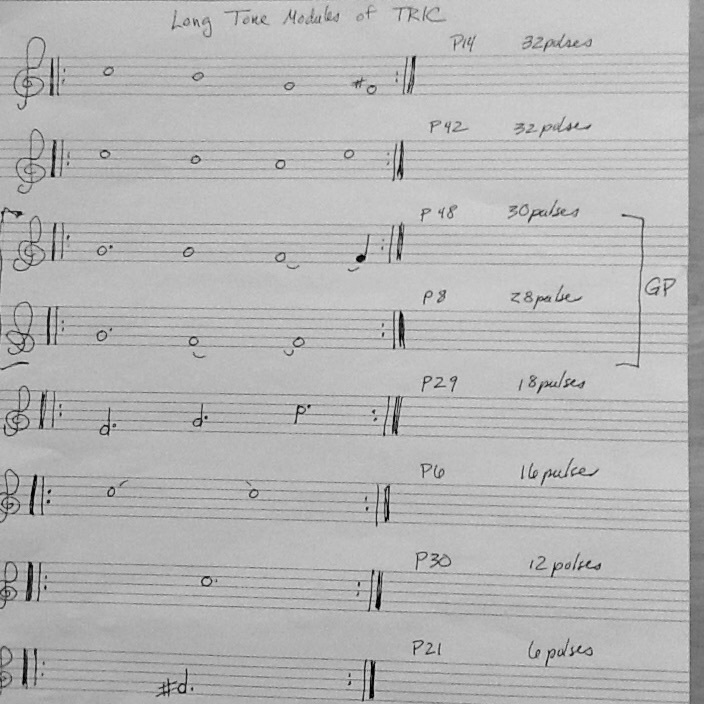 It is the scale of TRIC (Terry Riley’s In C). From here on, I will refer to this as Nature’s Scale, so as not to forget that this is a pattern of intervalic relationships that exists in the atmosphere and is imbedded in every sound we hear. The Law of the Octave is the first step in understanding how the frequencies of the Universe are vibrationally organized. 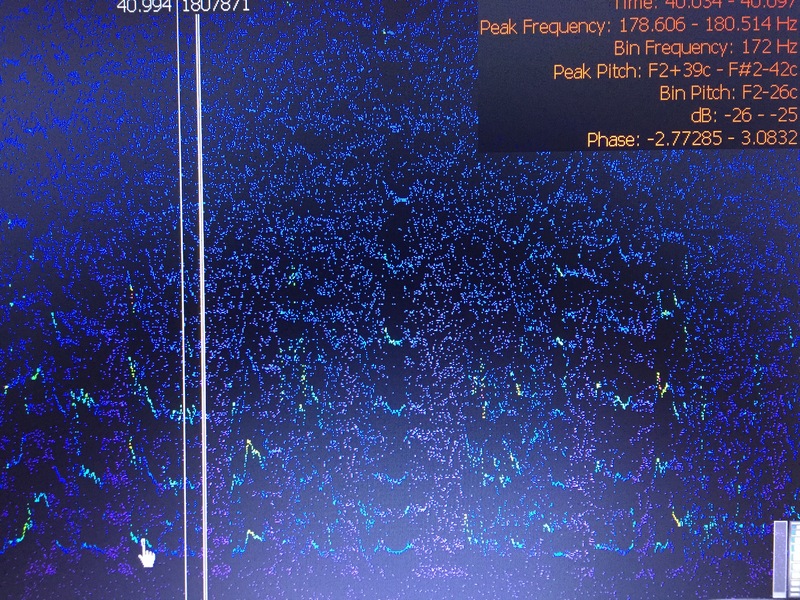 The fact that any frequency, doubled or halved, is a re-expression of the original frequency suggests the beginning of some kind of fractal movement. We have a place to return to and begin again; a place that comes around again later. The next step in understanding how frequencies are organized involves adding the fundamental frequency to itself over and over again. This creates a beautiful and repetitive frequency pattern that expands The Law of the Octave into what is often referred to as Nature’s Chord. Nature’s Chord is the same as the Harmonic Overtone series, which I have written about before. To get a really good idea how alchemical these tones are, you have to know their history. A long ago deep listener named Pythagoras was walking through town and heard the clanging hammers of metalsmiths. Then he really listened to the clanging and realized he was hearing high pitches when the small hammers were used and lower pitches when the large hammers were used. Then he tightened a string and noticed that dividing the string in particular ratio relationships created these beautiful harmonics. With the string tightened to a particular tone when plucked – lets say an A (at 220 Hz), Pythagoras discovered that vibrating half the string gave an octave higher version of the same tone A (now at 440 Hz). When 2/3 of the string was vibrated the tone will be E, which is the fifth interval from A and vibrates at 660 Hz – 220+220+220. When the next 220 gets added, we are back at the octave. Simply amazing! 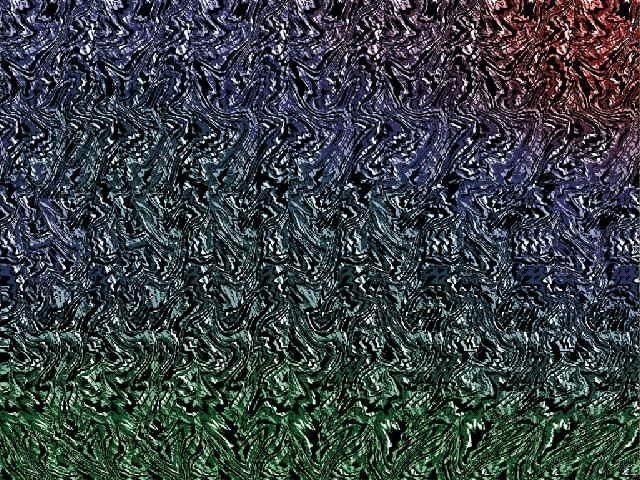 And on it goes, each iteration of the initial frequency, reveals another harmonic. After the A octave at 800 Hz comes the C# at 1100 Hz – this is a third above the fundamental tone. The Harmonic Overtone series has risen three octaves so far, and in that span has revealed the root chord structure for any music – the fundamental frequency, the third and the fifth. So, in our example, the A Major chord has been revealed through the harmonics inherent in the note we call A: A C# E.
Another overtone that comes out in the third octave is the flatted seventh. So, along with the root chord, we also get a nod to the seventh and its place in the most beautiful chord structures. The fourth octave reveals most of the remaining diatonic tones from the second, to the raised fourth, to the natural seventh. All of the tones we know in our most familiar musics are laid out in the first four octaves of the Harmonic Overtone series. 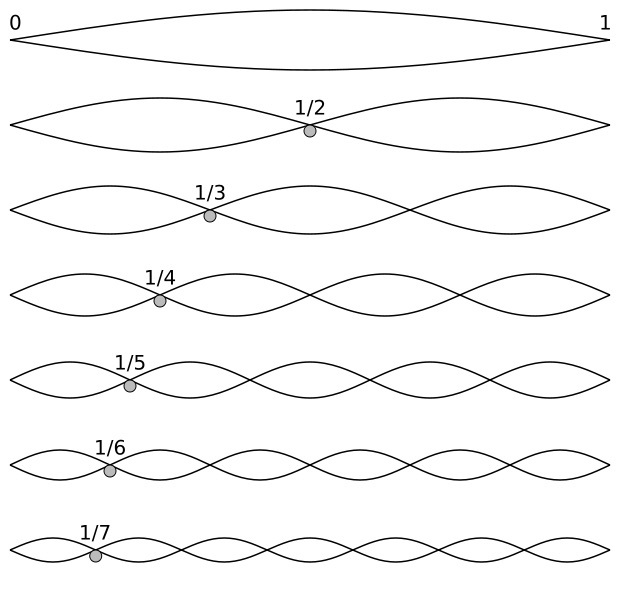 The number of overtones per octave doubles with each successive octave, so the next octave after the fourth octave would have 16 overtones and the next 32. At these levels the harmonics are so varied, close together, and difficult to hear that discrete pitches disappear into a percussive wash of sound. The amazing relevance of this chord to everything you hear is difficult to comprehend on first pass. The Law of the Octave and Nature’s Chord are undeniably present and absolutely inscrutable – wherever there is atmosphere, Nature’s Chord exists in potential. It is a preset pattern that awaits a disturbance to set it in motion. The disturbance moves the atmosphere and Nature’s Chord presents this disturbance to our ears in a beautiful harmonic package. The harmonic framework springs forth from the primary tones of all the sounds you hear. Each sound is characterized by the amount of and the “mix” of harmonics. Nature’s Chord is easily heard in strings, pipes, the voice – anything that can support a standing wave vibration and thus maintain a pitch. 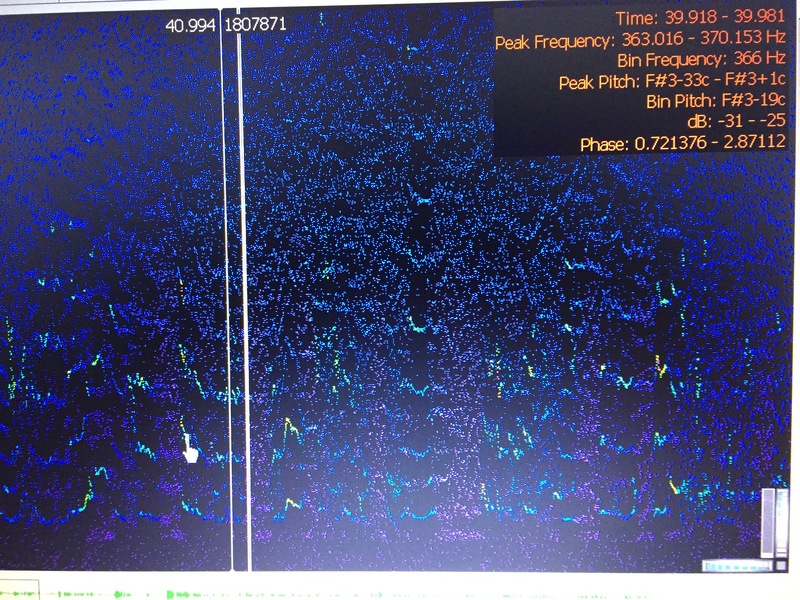 The mix gets less melodic when the waves are less harmonic and more dense. It is Nature’s Chord that renders what is known as timbre. Timbre is the “color” of sound and as easily recognized as red, blue, green, a knock on the door, your lover’s voice. The bottom line is F, the next line up is the re-expressed octave F, the next line is C the fifth overtone for F, the next the octave again and so on. 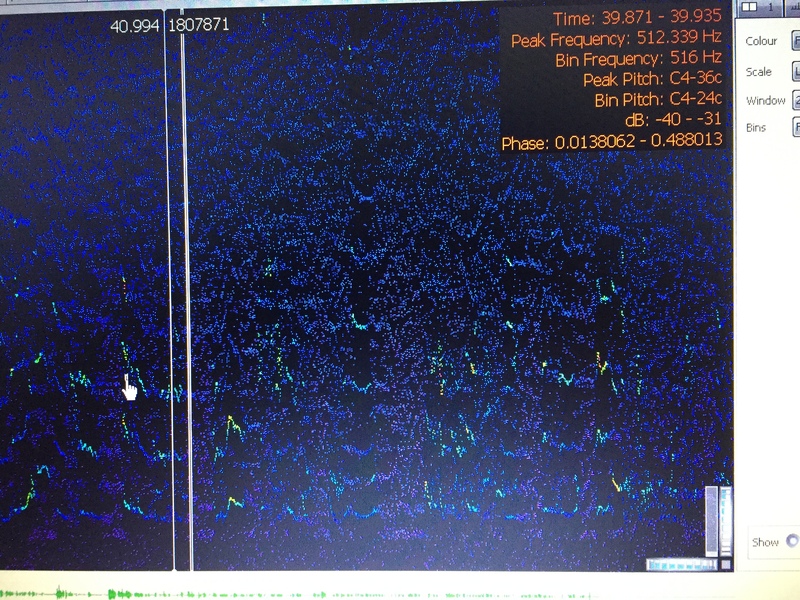 Look in the upper right corner and you can see the “pitch bin” for where the cursor is pointing: F F C – Nature’s Chord made flesh! How could you send a message that would never be destructible? Only in sound waves. Waves are indestructible. Wherever there’s a planet that has atmosphere, these overtones could be heard. Scientists are looking in telescopes and microscopes and they don’t realize that this is here, right here. The secret is all around us and nobody recognizes it. I am exploring tones and harmonics and octaves and fractals, oh my! Last year, I developed a piece for the Human Origami workshops based on the disruptive power of the 11th harmonic. I am expanding that piece and putting it into the iBoD repertoire. Invoking the Law of the Octave, the disruptive 11th Harmonic stirs the energy wherever a tone and its fifth are played. And the further apart they are, the closer you can get to that four octave span that produces the 11th harmonic, the more powerful the vibe! So here is an early version of 11th Harmonic – the first in a series of works inspired by Nature’s Chord!